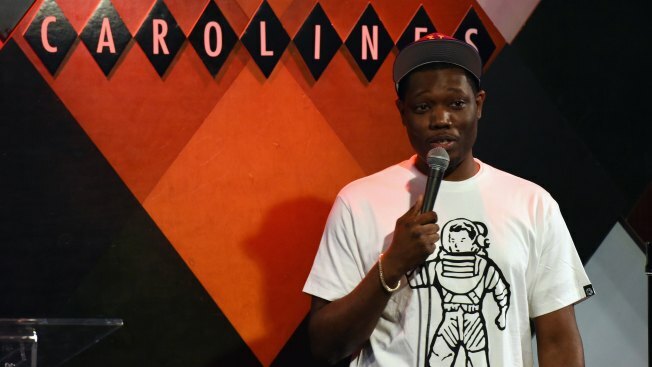 Che, who often jokes about President Donald Trump on the NBC show, told an audience he never apologizes for language or controversial statements because he's "just trying to be more presidential"
FILE - Comedian Michael Che performs onatage at Gildafest '16 at Carolines On Broadway on July 12, 2016, in New York City. "Saturday Night Live" star Michael Che is not backing away from comments he made about Boston, which he called the "most racist city" he has ever visited. The Boston Globe reports that the co-anchor of "Weekend Update" told a Boston University crowd Thursday about how he received angry messages on social media after he made the comment on "SNL" the night before the Super Bowl. He responded to one woman by urging her to "talk to your closest black friend and ask them to explain it to you." He says the woman responded by answering, "Touché." Che, who often jokes about President Donald Trump on the NBC show, told the audience he never apologizes for language or controversial statements because he's "just trying to be more presidential."